Immigrant Children: Put the Blame Where it Belongs! This week there was a huge gaggle of geese in the Whitehouse Pressroom. The media was in a frenzy over the insensitive, cruel, inhumane way our President is treating the immigrant children flooding over the border. If it’s not one thing it’s surely ten others. Every single thing is a political football filled with explosives in the hope of damaging a political enemy. We have heard from every media person, every politician, previous First Ladies and so many more “holier than thou” people about how wrong this is. Let’s talk about right and wrong. It is right for those desiring to come to America to enter our borders the right way. These people know that they are entering illegally and they know it is a crime and they know they will be separated from their children for a time. What they are doing is wrong, and they know it. It is right for our law enforcers to enforce our laws. I thought it was interesting for Laura Bush to criticize the enforcement of the very laws put in place during her husband’s administration. It was also rich for Mrs. Clinton and Mrs. Obama to criticize the very policies they upheld in their husbands administrations. I never heard any of them complain at those times, even though Obama deported more immigrants than any President in history and criminally charged 97,000. It is wrong that so many are misrepresenting the truths about illegal immigration. There is no time within our criminal justice system that children remain with their parents, save those that give birth in prison. Even then the child stays only a short time. The reasons for this is to PROTECT the child. The children are safer where they are than in a system with other adults and juveniles. The system protects everyone, as the parents work through that system. Let’s remember the hard facts that everyone seems to ignore. It was the parent who put their own child at risk in so many ways. First by the long arduous journey, next by coyotes and human traffickers that stand ready and eager to abuse those children. Some parents literally drop their kids and run if border patrol attempts to arrest them. Some send their children with coyotes or strangers across the border alone. And we are complaining about separating families? 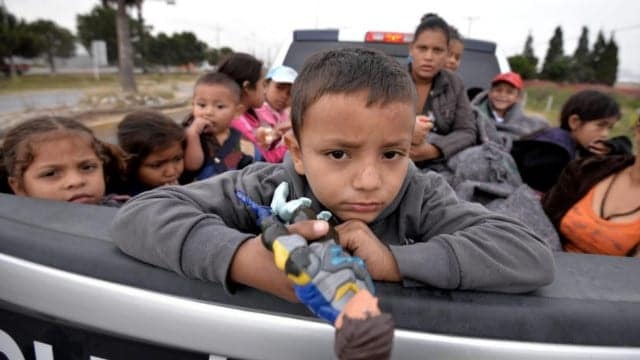 Our government is a compassionate government, and these children are in places where they have place to sleep, and food and clothing and toys and education. I promise you that is more than they had with those parents. We have no intention of permanently separating any families, but there are laws here and a process that is in place to protect those children that everyone is overreacting to. One reporter who took a photo of child wailing and crying, that created so much tugging of heart strings, was simply grandstanding or has no kids. I have three and that kind of wailing can happen over any number of things. I am not insensitive to the fact that these children would have some temporary distress, yes, yes and yes! But it is not the people or the President of the United States who did that, it is their very own families who did that. Put the blame where it lies. If we built the wall, these people would not get through to be separated. To the question of if they are being used to force a change in our immigration laws, I sincerely hope so, because nothing else has made our do nothing Congress and Senate get anything done, and that was under Bush, Clinton, Bush, and Obama. Every one of them said during their Presidency that something had to be done, that people cannot just illegally enter our country, and none of them did a thing, nor did the legislature. Please stop insulting our intelligence as to how these kids are suffering. These kids have parents who committed a criminal act, knowing the consequences and one of those consequences is temporary separation from their kids, and they made a choice, and their kids lost. Not because of President Trump, because of the parents. I applaud our President for upholding the laws. Under Obama, they selected which laws they would uphold and which not, and that was far more wrong than this. They made the problem far worse for their refusal to uphold the laws of our country. Our Congress and Senate need to grow something that will give them the guts to make the changes that will benefit American citizens, not illegal aliens. People must enter through a port of entry, then they do not lose their children. By the way, here is what really rubs me on all of these child sensitive media and politicians. We have serious problems with child abuse in this country. Where is the outcry for those children whom we do not protect though our social services, or our justice department. We have serious drug problems in our youth, we have human trafficking problems, where is the outcry? We are not the world’s savior, we cannot be. But we absolutely can be the savior to American children being battered and broken and sexually abused every day in their own homes, and we are the three monkeys who see nothing, hear nothing, say nothing. Get on that bandwagon and help some of our kids who would love to be in one of those centers where the immigrant children are fed and watched over and safe, instead of in a dark closet with no food, or chained to a bedpost in their own feces. You politicians and media really don’t have a care about these children of the illegals being separated, not even a little, it is about demeaning our President. Anyone who truly cares about children understands from a legal, a safety and a welfare vantage, that what is being done is what should be done, and is not cruel, but is for their welfare. Let’s see you care this much for our children who really need a voice and action to help them escape the terror they deal with every day in their young lives. You cannot cry for one and ignore the other. …and to the Republicans who won’t support and want to kick the can further down the road, and make small fixes like letting kids stay with their families, you are dead wrong. Stand behind our President as we elected him to do these things. They are hard but you cannot wilt and give in every time there is a hard decision. I support upholding the law, and limiting our immigration to those who enter only one way, the right way.